A host of Trump’s anti-trade policies has been playing foul in the stock market, leading to increased market uncertainty and trade tensions between the United States and countries around the world. This is especially true given that Trump’s tariffs have sparked concerns related to global trade, economic growth and political stability. After both the United States and China reached an agreement and vowed not to launch a trade war against each other, Trump’s announcement to impose a hefty 25% tariff on $50 billion worth of Chinese goods escalated tensions between the two. Trump also plans to restrict Chinese investment in U.S. companies and limit the number of goods that these can sell to China. 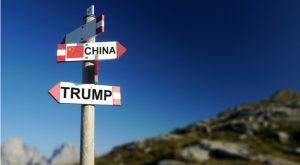 The move has led to negative response from China as Beijing refused to buy more American goods until the Trump administration agrees not to impose further tariffs on exports by the former. “If the United States introduces trade measures, including an increase of tariffs, all the economic and trade outcomes negotiated by the two parties will not take effect,” China said in a statement distributed by the state-controlled news media. On the other hand, the trade war dispute between the United States and its biggest allies — the European Union, Canada and Mexico — intensified after Trump levied a 25% tariff on steel and 10% on aluminum imports from on national security grounds, ending their temporary exemptions that expired on Jun 1. This move also led to retaliation from these countries targeting American products worth billions of dollars. The European Union is seeking to hit back with $7.5 billion of levies on U.S. exports, including motorcycles, denim, cigarettes, cranberry juice and peanut butter, as early as Jun 20 and launched a case against American measures at the World Trade Organization. Canada announced punitive measures with 25% tariff on steel imports from the United States and a 10% tariff on aluminum. It will also impose duties on other goods including playing cards, inflatable boats, yogurt and toilet papers. The total value of American goods subject to tariff is $12.8 billion, effective Jul 1. Mexico plans to retaliate by targeting products from congressional districts that Trump’s Republican Party is fighting to retain in the November election. In addition, it would impose levies on a wide range of U.S. goods, some steel and pipe products, lamps, berries, grapes, apples, cold cuts, pork chops and various cheese products “up to an amount comparable to the level of damage” linked to U.S. tariffs. While this is not enough, the Trump administration is also considering slapping tariffs on U.S. auto imports, which could hit top suppliers from Mexico, Canada, Japan and Germany. Added to the woes was a report that the United States is mulling over an end to the import of German luxury vehicles to the United States. Trump’s primary target is Mercedes-Benz, according to the German business magazine WirtschaftsWoche. The ongoing disputes would boomerang and hit economic growth across the world, leading to job losses. According to the International Monetary Fund, the trade spat has clouded a favorable outlook for the global economy, which is on track to grow at its fastest pace since 2011 this year and the next. The threat of global war has raised the appeal for the bullion as a store of value and hedge against market turmoil. The ultra-popular product tracking this bullion, SPDR Gold Trust ETF (NYSEARCA:GLD), could be an interesting pick in the current market turbulence. The fund tracks the price of gold bullion measured in U.S. dollars, and kept in London under the custody of HSBC Bank USA. It charges 40 bps in fees per year from investors and has a Zacks ETF Rank #3 (Hold) with a Medium risk outlook. While volatility products have been terrible performers over the medium and long terms due to a contangoed market and a steep roll cost, they seem intriguing picks in the current tariff talk environment, which would bolster instability in global stock markets in the weeks ahead. As a result, investors should stock up volatility ETFs like iPath S&P 500 VIX Short-Term Futures ETN (NYSEARCA:VXX) into their portfolio. The ETN focuses on the S&P 500 VIX Short-Term Futures Index, which reflects implied volatility in the S&P 500 index at various points along the volatility forward curve. It provides investors with exposure to a daily rolling long position in the first and second months VIX futures contracts. The note charges 89 bps in fees per year. Though iShares 20+ Year Treasury Bond ETF (NASDAQ:TLT) has been out of investors’ favor due to rising yields and has an unfavorable Zacks ETF Rank #4 (Sell) with a High risk outlook, the deepening trade dispute could help it draw some attention. This is because the products tracking the long end of the yield curve often provide a safe haven. TLT provides exposure to long-term Treasury bonds by tracking the ICE U.S. Treasury 20+ Year Bond Index. It is one of the most popular and liquid ETFs in the bond space with AUM of $6.6 billion and comes with 0.15% in expense ratio. Holding 30 securities in its basket, the fund focuses on the top credit rating bonds with average maturity of 25.76 years and effective duration of 17.56 years. Yen is considered a safe-haven currency in times of uncertainty. Investors could tap this via PowerShares CurrencyShares Japanese Yen Trust (NYSEARCA:FXY), which appears a great way to play a future rise in the yen relative to the U.S. dollar. It tracks the movement of the yen relative to the U.S. dollar. The fund charges 40 bps a year in fees and has accumulated $167.5 million in its asset base. It has a Zacks ETF Rank #3 with a Medium risk outlook. Investors could seek shelter in a basket of small-cap stocks that have less international exposure and generate most of their revenues from the domestic market. These pint-sized stocks are less vulnerable to trade war or any other political issues and could better insulate investors against Trump’s trade-protectionism policy. While the small-cap space is crowded with ETFs, the ultra-popular iShares Russell 2000 ETF (NYSEARCA:IWM) having a Zacks ETF Rank # 3 and a Medium risk outlook could be the best pick. It has AUM of $47.6 billion and charges 20 bps in expense ratio. AdvisorShares Ranger Equity Bear ETF (NYSEARCA:HDGE) is actively managed and seeks capital appreciation by taking short positions in a number of U.S. listed companies with low earnings quality or aggressive accounting practices. Additionally, the managers will look to identify earnings-driven events that could lead to price declines such as downward earnings revisions or reduced forward guidance – the two factors that can spell trouble for a company. These securities with potentially weak fundamentals will underperform in a crumbling market, thereby resulting in strong profits for the fund. HDGE has amassed $144.6 million in its asset base and is a bit pricey, charging 2.86% in annual fees. The dividend-paying securities are the major sources of consistent income for investors when returns from the equity market are at risk. This is especially true as these stocks offer the best of both these world’s — safety in the form of payouts and stability in the form of mature companies that are less volatile to the large swings in stock prices. The companies that offer dividends generally act as a hedge against economic uncertainty and provide downside protection by offering outsized payouts or sizable yields on a regular basis. While the dividend space has been crowded, ETFs with stocks having a strong history of dividend growth like the Vanguard Dividend Appreciation ETF (NYSEARCA:VIG) seem to be good picks. The ETF has AUM of $27.9 million and charges 8 bps in annual fees. It has a Zacks ETF Rank #2 (Buy) and a Medium risk outlook. Article printed from InvestorPlace Media, https://investorplace.com/2018/06/7-exciting-etf-profit-ongoing-trade-spat-ggsyn/.